Having gone to fourth on the UK under-15 800m all-time rankings with her 2:08.21 in a BMC race at Hendon, Saskia Millard has her sights set on going sub-2:06 in 2015. 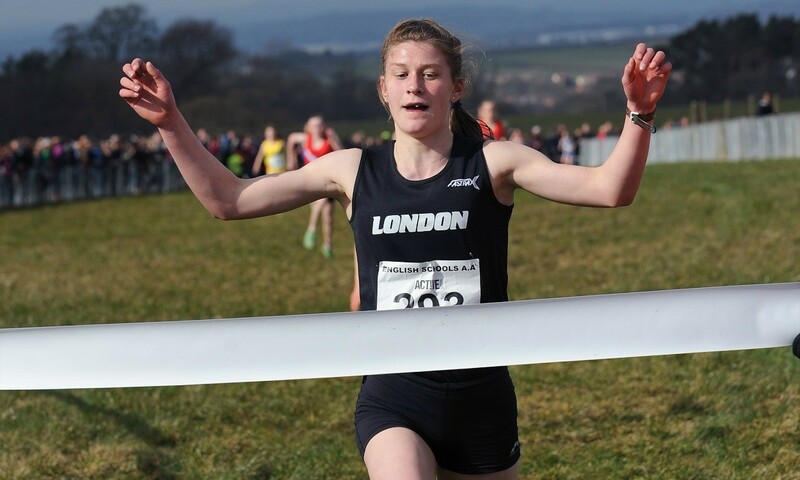 The versatile 14-year-old enjoyed a successful season, claiming titles over 800m at the England Athletics Indoor Championships and on the country at the English Schools Cross Country Championships. Outdoors, the Herne Hill Harrier took bronze at the English Schools over 800m. “Although all of these medals are very important to me, my highlight would have to be winning the National Indoors at Sheffield because it was my first national title and it gave me lots of confidence for the track season. It was also one of the first times I had followed a race plan and I learned a lot from that race,” reflects Saskia. Such is her talent over a range of distances, Saskia also wants to try a 400m in 2015. “I really want to go sub 2:06 this year for 800m as well as run a competitive 400, as people are often saying that my physique is probably more suited to this distance,” she explains. Before that, Saskia has her sights set on a top-eight finish in the intermediate age group at the English Schools Cross Country, which would ensure England selection for the SIAB Schools International. She also hopes to compete at the national indoors, although she is aware that the under-17 age group will pose more of a challenge. When it comes to the long term, like most young athletes, Saskia would love to make it to the Olympic Games. However, the level-headed youngster is keen to take things one step at a time. “The most important thing at the moment is to continue to enjoy my running and stay injury free,” she says. Sporting success runs in the genes, as Saskia’s mum ran in the junior girls’ 800m at the English Schools, while her dad was a professional rugby player and captained Scotland at the 1993 World Cup Sevens. Meanwhile her younger brother Oscar was ranked fourth in the under-13 age group in the UK for 1500m and her younger sister also enjoys the sport. On a sports scholarship at Alleyn’s School in Dulwich, the talented all-round sportswoman also plays county hockey and netball for her school and was part of the school team that won the English Schools waterpolo championships. Therefore, Saskia trains only two or three times a week for athletics with her coach James McDonald as part of a large group of about 60 athletes. “I particularly like running with some of the older boys because it means I can really push myself,” says Saskia. You can find further performance stats on Saskia on Power of 10 here.